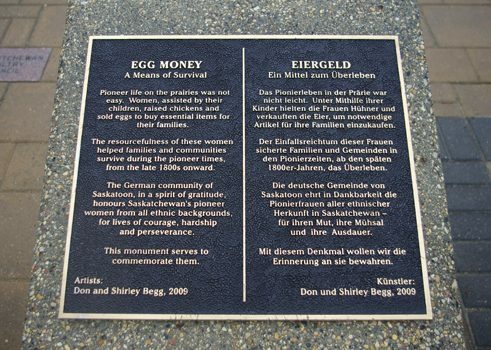 Located at the Saskatoon Farmers Market at River Landing, along the South Saskatchewan River, the Egg Money sculpture pays tribute to pioneer women in the early history of Saskatchewan. This artwork is crafted from bronze and was created by the artists Shirley and Don Begg of the Studio West Bronze Foundry in Cochrane, Alberta. 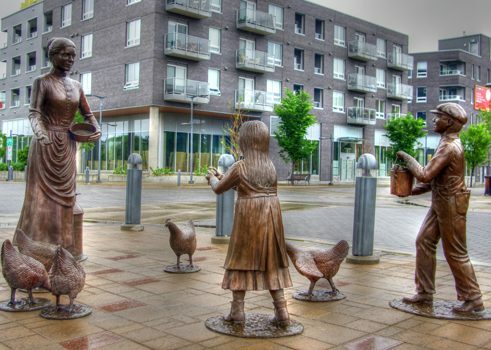 The sculpture portrays a woman with two children beside a cream can and several chickens afoot that they are all feeding. The original intent of this project was to pay tribute to early settler women in Saskatchewan and to acknowledge that these “unsung heroes” deserve more recognition for their contributions towards building Saskatchewan. The life of these women was “life-giving and life-sustaining in the face of isolation, loneliness, hardship and unending labour”. In 2005, Saskatchewan’s centennial year, a small group of men and women of German heritage met in Saskatoon to plan a German Days celebration to be held in fall of that year. This was to be the first such celebration since 1932. It was then that the idea was born to support a project specifically focusing on honouring the little acknowledged role of women in settling Saskatchewan and creating a province which was heavily focused and invested in agriculture. To fund the sculpture, 24 families came forward in support of the project and provided the name of their family pioneer woman. They represent 10 different nationalities (American, British, French, German, Hungarian, Norwegian, Russian, Scottish, Swedish and Ukrainian). Ellen Remai of the Frank and Ellen Remai Foundation approached the committee, offering major sponsorship of the project. The Egg Money sculpture was unveiled on September 20, 2009. 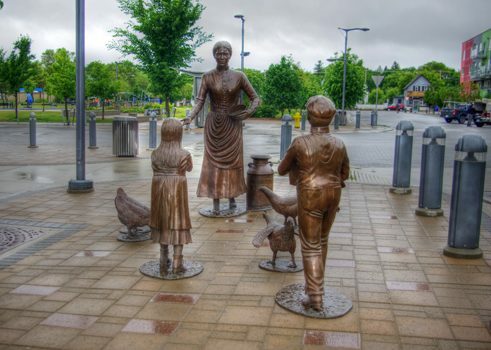 With the sculpture in place, a group of four women now making up the “German Days Committee”, themselves immigrants from Germany and passionate about preserving the memories of these pioneer women, decided to complement the sculpture with a book also called “Egg Money”. The book is a collection of the stories of these 24 prairie women, recalled by their families. It is the hope of the group that parents and grandparents read the stories of these remarkable women to their children, perhaps while sitting on the benches by the statue and so instilling in them the memory, appreciation and gratitude of those who had gone before them. The former “German Days Committee” is now called “KulturGarten Saskatoon”.